DESPITE infantile denials that they had nothing to do with the Baba Jukwa Facebook page, or that their e-mail had not been hacked to expose the identity of those behind the page, the shadowy Facebook character on Tuesday admitted that hackers locked “him” out of his e-mail account last year. 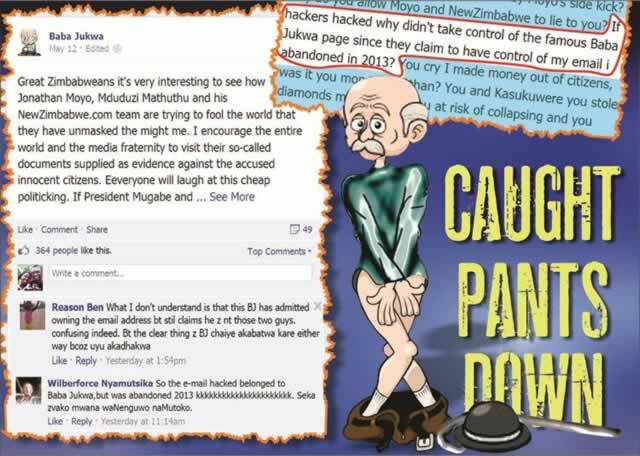 Hackers, who were working to unravel the identity of Baba Jukwa since last year, at the weekend identified two South Africa-based Zimbabwean journalists — Mkhululi Chimoio and Mxolisi Ncube — as the people administering the scandalous Facebook page. The pair, in their private chats, admitted to fabricating most of the information on the page to cast Zanu-PF, its leadership, members and supporters in bad light and to prop up the fortunes of the opposition MDC-T. The hackers took control of the e-mail account, [email protected], and locked out its owners last year, though the administrators — who are still in control of the Facebook page — opened another account to continue operating. And in a bid to hit back at the Sunday Mail, and Chronicle for breaking the story and the Minister of Information, Media and Broadcasting Services for commenting on the expose, Baba Jukwa posted his usual scandalous allegations against the editors of the paper and Minister Jonathan Moyo in which he unwittingly let the cat out of the bag. In their responses several people asked why Baba Jukwa was denying that he was exposed when he had just admitted that the hacked email was his. ‘’What I don’t understand is that this BJ has admitted owning the email address but still claims he is not those two guys, confusing indeed. But the clear thing is BJ chaiye akabatwa kare either way because uyu akadhakwa,’’ said one Reason Ben. The syndicate apparently panicked at the weekend and removed some of the more sensational posts that can potentially lead to criminal charges. A cache of emails hacked from Gmail account [email protected] last year exposed the duo admitting to lying to their followers in addition to extorting an undisclosed amount of money to fund their project. “Baba Jukwa” last year claimed that President Mugabe and Zanu-PF had put a US$300 000 bounty on their heads. But an e-mail dated July 6, 2013 addressed to one Commander Milan, “Baba Jukwa” laughed about how he had made up the bounty claim. Some media organisations, including British newspaper The Guardian, ran stories based on “Baba Jukwa’s” lies. The Facebook page also carried posts of private cell numbers of prominent people and exhorted the public to call them and harass them. Several affected people said they experienced serious trauma in the form of insults and verbal abuse and called for the arrests of the administrators. In interviews with The Herald, they recounted how they were affected by the intrusion into their privacy. Some of them said those behind the Facebook page should apologise to the nation. Presidential spokesperson Mr George Charamba added, “They gave Charamba’s number claiming it to be President Mugabe’s number. I received numerous calls and most of them were, however, congratulating the President and of course some were insulting me. Mr Charamba said another time “Baba Jukwa” posted his cell phone number claiming that it was that of a girl searching for “a serious boyfriend”. “I endured three months of courtship from several boys from South Africa and others in the United Kingdom who were using hidden numbers,” he said. Mr Charamba said he reported the matter to the Posts and Telecommunications Regulatory Authority of Zimbabwe. A senior security official who declined to be named said the architects of “Baba Jukwa” character were an extension of the illegal regime change agenda and must be sued.